A lot can happen in 25 years. Look back on the history of girl’s and women’s hockey and that’s immediately clear. Women’s hockey was first introduced on the international stage in 1990 with the Women’s World Ice Hockey Championships. Eight years later women made their Olympic debut in Japan—with Team USA taking home Gold. Throughout that same time—and in Minnesota even slightly before—girl’s associations, and high school and college teams, began to spring up. In 1990 there were 6,336 registered females playing hockey in the United States. In 2014-15 there were 69,744. Over that same stretch of time, Minnesota went from 961 female players to 12,808. But while hockey was booming for females of all ages, something was still missing. Girls growing up with the game only had the Olympic team to dream about. Team USA was the only vision that allowed females to continue playing hockey at a high-level past college—until now, thanks to the National Women’s Hockey League, the first-ever paid-for-play professional women’s league in the world. Rylan used to be one of those little girls dreaming of playing hockey past college. A former player for the Northeastern Huskies, she originally wanted to bring a Canadian Women’s Hockey League expansion team to New York in 2014. When that didn’t work, she decided to create her own team—and the league that went with it. Teaming up with U.S. Olympian and world-renowned women’s hockey player and advocate Angela Ruggiero, the pair introduced the NWHL in March of 2015. 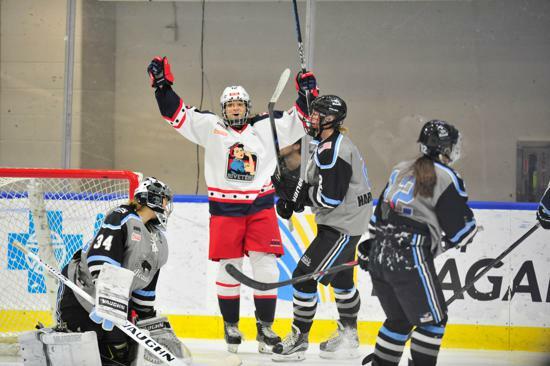 Comprised of four teams—the New York Riveters, Buffalo Beauts, Boston Pride and Connecticut Whale—the NWHL requires players to finish college before they are allowed to play in the league. A draft conducted in June fills a team’s roster, along with free agent training camps held throughout the summer. 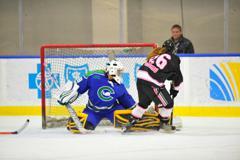 One Minnesotan who found her way on to the roster this inaugural season was Lakeville netminder Chelsea Laden. When Laura Halldorson, former University of Minnesota women’s head coach, first played hockey, the idea of a professional league was beyond crazy. 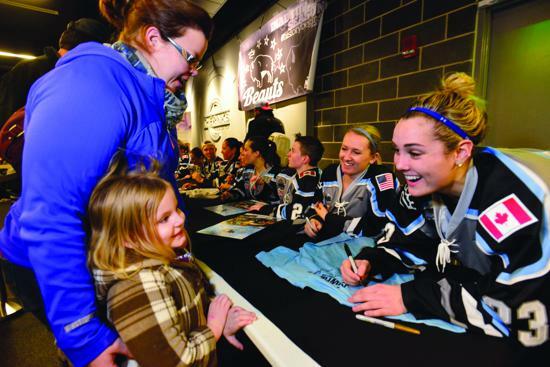 Chelsea Laden of Lakeville is one of two Minnesotans currently playing in the NWHL. Laden is between the pipes for Connecticut Whale. "NEW GIRLS GETTING INVOLVED IN THE GAME WILL NEVER KNOW THAT THERE WAS EVER ANOTHER WAY; THAT THERE WAS NEVER NOT A PROFESSIONAL WOMEN'S HOCKEY LEAGUE. THAT'S THE REALLY SPECIAL THING ABOUT IT." Girls in their youth association jerseys lined the glass at Ridder Arena where the Minnesota Whitecaps hosted the Boston Pride earlier this season. More young girls excitedly wait near the tunnel and in the stands, hoping to catch a glimpse of their heroes—real professional female hockey players. As with NHL teams, a big part of ensuring success in the NWHL is getting the youth associations on board. “It’s a huge part of our business model,” explained Rylan. “We want to get our players involved at the grassroots level and really grow the game as a whole and not only develop a fan base, but also help the next generation reach this level and have the opportunity to play professional hockey. Garvin and her friends are positive that they will be suited up like their role models some day. For Laden and her friends and teammates, that’s a pretty cool thought, too. 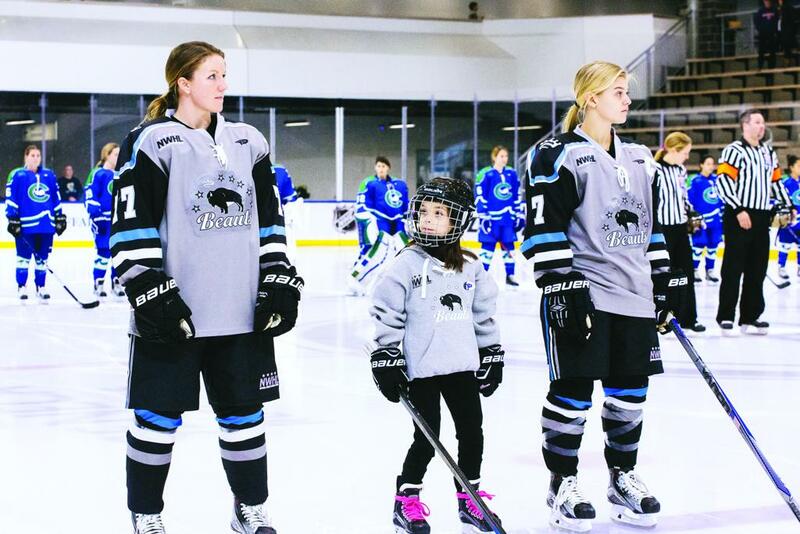 The NWHL created a buzz not just in the youth teams, but also in the communities that house them. According to Rylan, each correlating city has welcomed the team with open arms, leading to a successful introductory season. Expansion is the ever-present question surrounding the league, voiced especially loud from the State of Hockey. In 2014-15, Minnesota accounted for roughly 18% of the nation’s total female registration numbers. “Minnesota is the State of Hockey, for boys and girls, so it’s very obvious that there’s a great product coming out of there,” admits Rylan. 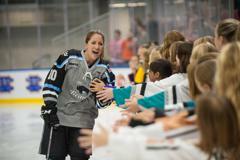 “It’s a hotbed and it’s an area that we are very interested in including [in the NWHL]. It’s a market we will continue to tap for talent and potentially a team down the road. “I think the biggest obstacle with Minnesota is the fact that we would need to fly out there. Right now, we are a regionalized busing league, and it’s part of our business model to keep travel costs down." Despite location and a limited budget remaining an uphill battle for Rylan, the NWHL and Minnesota, she expects to see the league continue to grow and foster the game along with it. After all, a lot can happen in 25 years. "I see the league thriving," Rylan states. "When you think 10, 15, 20 or 25 years from now, there might be a girl who started playing hockey because of the NWHL. I think that's when this really comes full circle and really becomes somethign special. When someone can say 'Gigi Marvin was my favorite hockey player growing up and I want to play for the Boston Pride,' that's when you know we've made it."